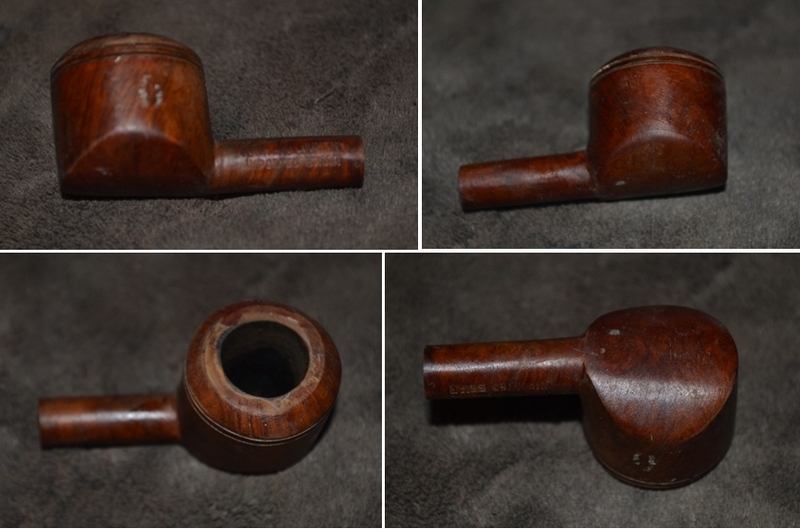 When this odd little pipe arrived in the mail a couple of months ago, as part of an estate lot, it stood out, to be sure. 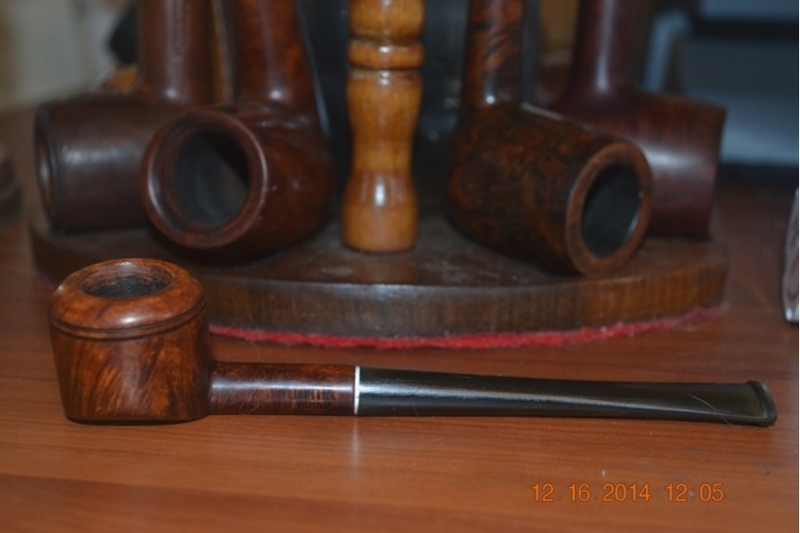 Amongst a beautiful Kaywoodie Standard mixed Sandblast/Smooth Grain Billiard, an elegant LHS Park Lane DeLuxe Dublin, a vintage WDC Full Bent Billiard with 14K ring, an Ehrlich Rusticated Billiard and two others – yes, it stood out. I will leave it to the reader to determine the nature of the deviation. 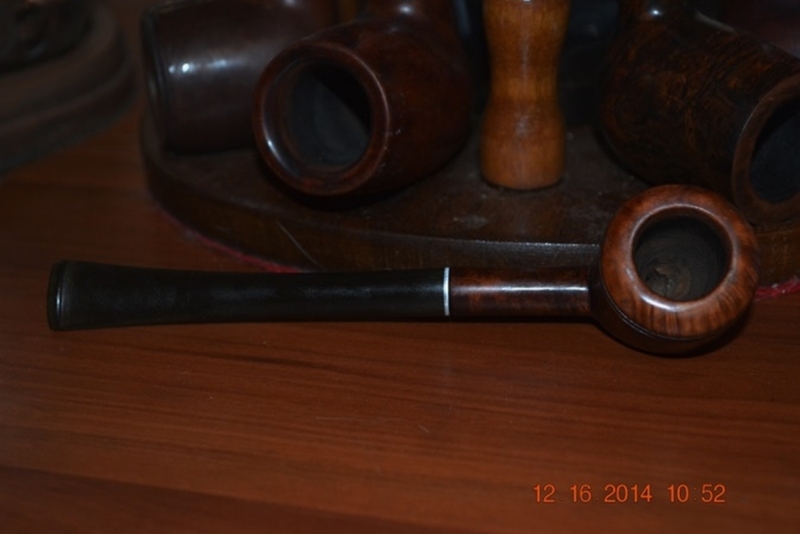 Still, it did force me to reconsider the true form and figure of a Rhodesian, and to imagine the turmoil I could incite if I threw this pipe as an example into the ongoing brouhaha that is the Bulldog versus Rhodesian debate. I do have a touch of Old Nick in me that way (and I don’t mean St. Nick). 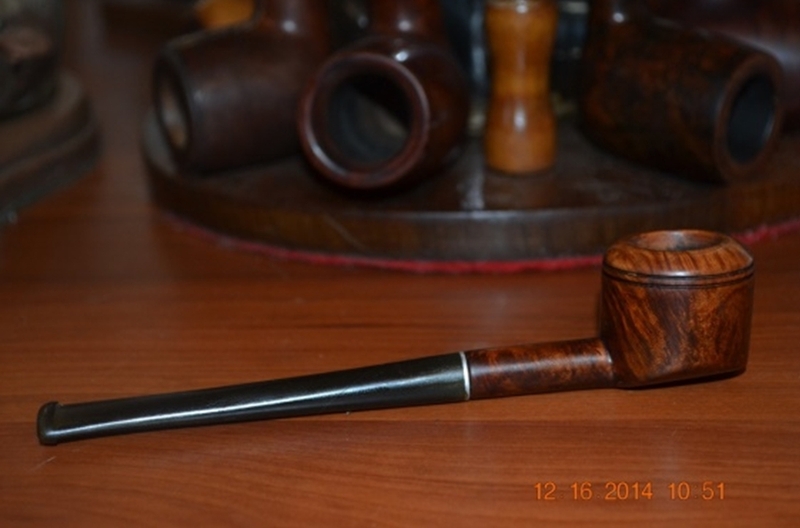 Yet how else can I describe this weird pipe, at its basest, but as a Rhodesian, despite the squatness of its stature and the roundness of the bottom of the bowl? 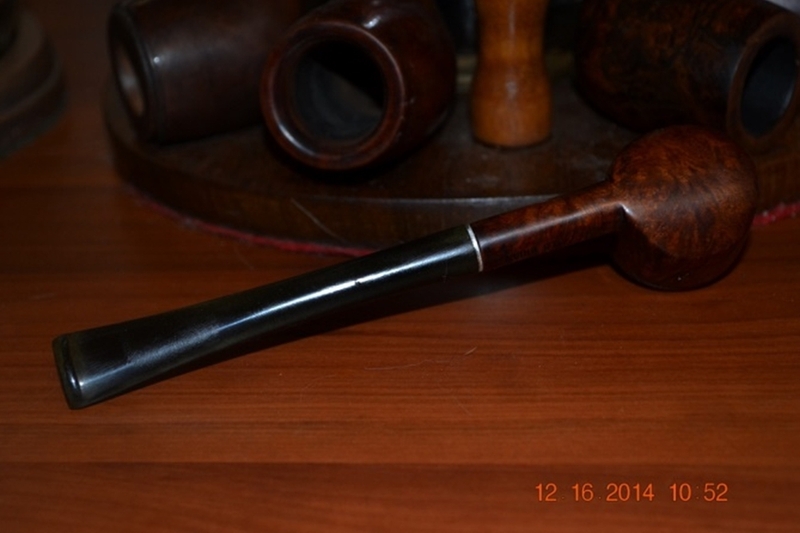 The fact is that this Town and Country (made by the Bradberry Briar Pipe Corp. of New York) has a rounded bowl with two slits carved into its upper end below the rim and a round shank. Part of me did not want to mess with the original stain, but some impulse screamed at me, “Drown this thing in Everclear and see what lies beneath!” And so, that I did. As it turned out, the voice was right. All kinds of scratches and other flaws became apparent where they were obscured before. Beginning the process of removing the various blemishes with a thorough sanding (except for the nomenclature)using 220-grit paper, I was careful to make smooth, even runs in the directions of the grain. 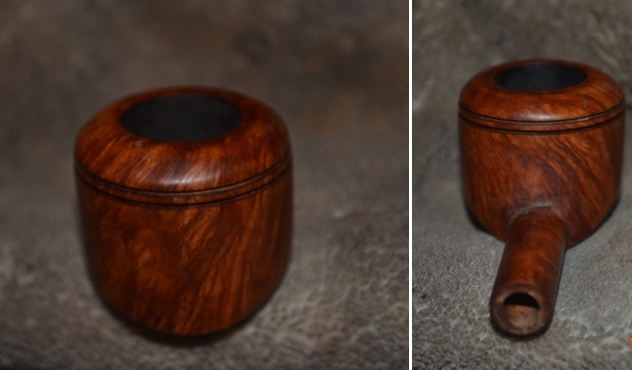 After some time at this task, rubbing the fine briar dust away with a rag as I progressed, I was at last satisfied with the results. To prep the wood for staining, I brushed the surface with super fine steel wool, which returned the natural color of the briar and created a light sheen. Then I commenced a thorough de-wrinkling treatment with micromesh pads, starting with 1500, then 1800, 2400, 3200 and 4000. Again, I rubbed the wood clear of any residue between each micromesh pad. The obvious next step seemed to be a full cleaning of the pipe’s interior. 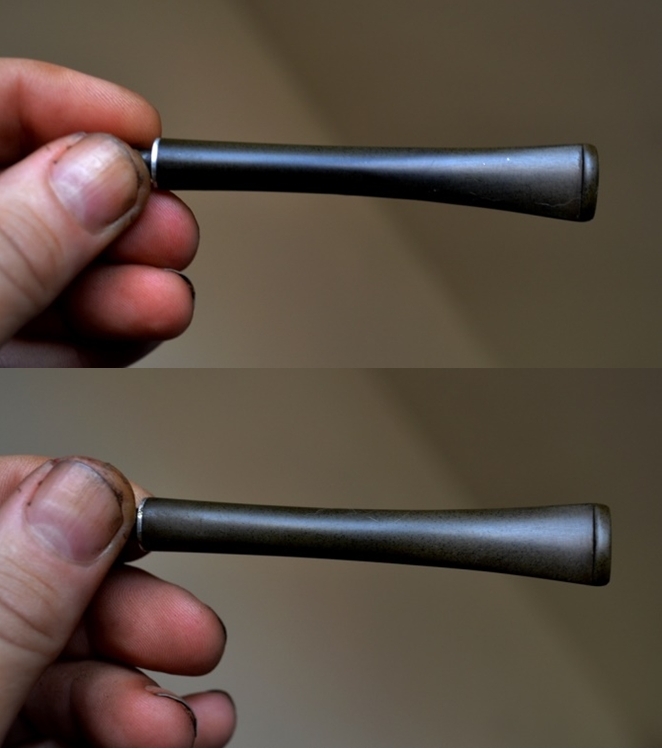 Expecting to find the usual massive buildup of crud associated with the shanks of most estate pipes, I was in fact shocked to see the wire-handled, heavy-duty bristly cleaner, dipped in Everclear, emerge from the exercise almost un-befouled the first time and spotless the second. Still wary, I sanded the pinky-sized circumference of the chamber with a Lilliputian-sized scrap of 220-grit paper and succeeded in removing a fair amount of carbon. Then I inserted an alcohol-soaked square of gun cleaning cotton cloth and twirled it with the aforementioned pinky until most of the carbon residue was cleared from the chamber. Despite the failure of the wire cleaner to dig up more than trace elements of old tobacco, and determined to assure the shank was truly ready to pass anyone’s test, I employed my newly acquired proficiency in retorting. To my utter dismay, despite my certainty that I had performed the retort without error, the remainder of the boiling alcohol – which had surged all the way into the chamber and left the cotton there somewhat dirtier than it started – returned to the Pyrex test tube clear enough to drink, if I were so inclined. Disbelieving the unheard of result, I re-boiled the alcohol in a second and sent it packing again whence it had returned once empty-handed, so to speak. The second try came back as clean as the first. At last, my mind exploded in dizzying exultation, a clean shank at the outset! I turned to the stem, which, other than being a uniform military green, was all but devoid of scratches or chatter. There was one small ding, but given the usual mauling of stems I encounter, this one was a gift from Heaven. 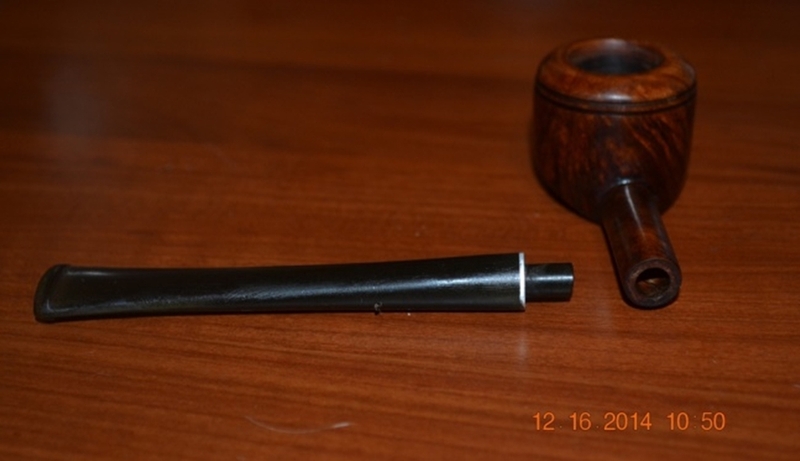 As I have yet to come up with a formula for a solution in which to treat stems, I was compelled to do it the old fashioned way: by hand, using 320-grit paper to restore the stem from green to black. This step required several passes, more and more localized each time. Next I turned to micromesh and gave the stem the same care I provided the wood: 1500, 1800, 2400, 3200 and 4000. 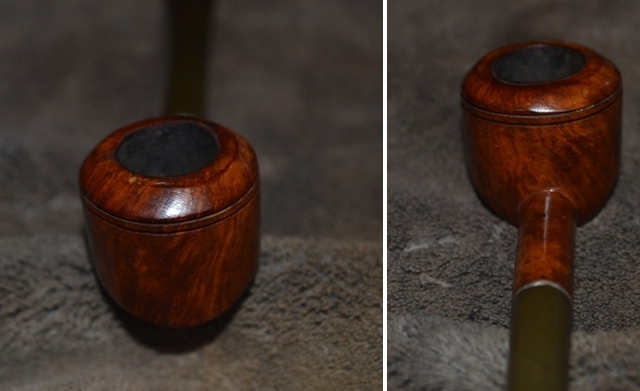 I tend to enjoy re-staining the wood of a pipe when necessary, and my biggest question so far had been what shade of brown to use if not marine (burgundy) red. 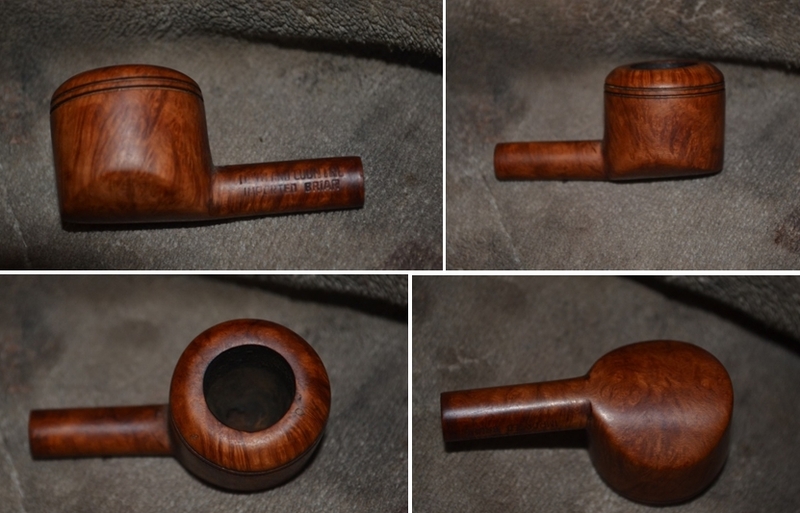 This pipe I wanted to do as a two-tone, with the beautiful natural color and grain of the rounded rim left unchanged and the rest of the bowl and shank dark enough to show the difference. And so the only question was whether to use medium brown, which is darker than it sounds, or marine? I admit to having a fluttery, nervous feeling in my stomach when I opted for the marine. Although the result was better than okay, I won’t be showing it here for reasons that will soon be apparent. 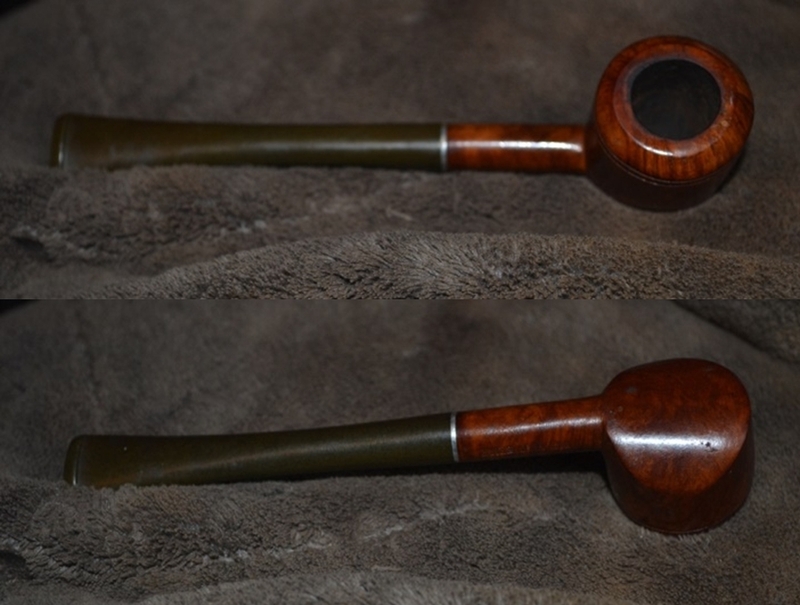 Having stained the majority of the wood marine and left the round rim plain, I flamed out the alcohol from the boot stain, buffed the greater part of the wood with its resulting ash using 3200 micromesh and then waxed the wood and stem – from which I had removed the superfluous metal tenon extension by heating it with my Bic and yanking it out – and achieved a definite high contrast. The grain still showed through the stain, but I knew it wasn’t right. Therefore, wishing to have a little fun and test my mentor, Chuck Richards, I took the “almost finished” product to him for his opinion. True to form, Chuck scrutinized every angle of the pipe through his glasses and handed it back to me. His critique was like the ultimate New Yorker bad book review: no comment. He still has no idea how good that made me feel! 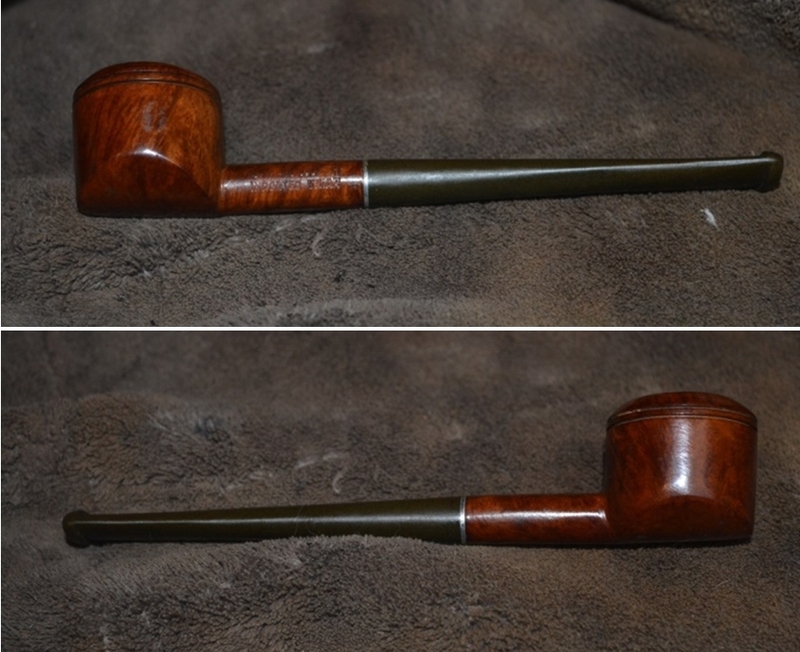 Pleased with myself, I later returned home with the dark red body of the pipe topped by a blond head and with care again applied the super fine steel wool to remove the wax and stain on all of the wood but the rim. Ready for the correct approach, I re-stained most of the wood medium brown, went through all of the steps as before to prepare it for waxing on my two buffer machines, and applied white and red Tripoli, White Diamond and carnauba. The result was much more satisfying, and I felt no need to run it by Chuck again before submitting this blog, as I had already messed with him enough, albeit unbeknownst to my good friend. All fun and pranks with my big-hearted but not coddling mentor aside, I ended this restoration with more work than was necessary. I should have learned by now not to disregard the advice of that little fluttery feeling of unease I had in my stomach when I chose marine over medium brown. In the end, the stomach almost always wins in all matters over the mind. This entry was posted in Pipe Refurbishing Essays and tagged articles by Robert M. Boughton, Bowl - finishing, Bowl - refinishing, Bowls - refinishing, Bradberry Briar Pipe Corp, Bradberry Briar Pipe Corp of New York, micromesh sanding pads, pipe refurbishing, refinishing, refurbishing, restaining a bowl and rim, Robert M. Boughton articles, sanding a stem, stem work, Town and Country Pipe on December 16, 2014 by rebornpipes.